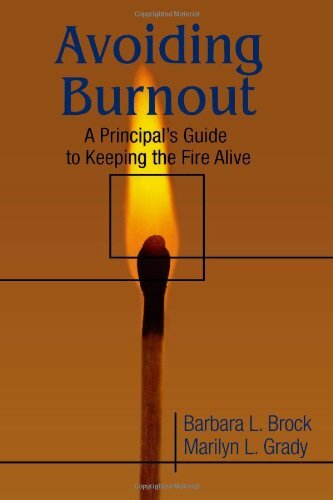 Brock and Marilyn L. Grady turn their expert attention to administrator burnout in this unique and powerful new "how-to" book. Avoiding Burnout presents real-world success stories from individual school administrators across the country. How do they handle stress and burnout? What can be learned from their individual challenges and solutions? Principals at all levels will learn a great deal about: The nature of stress Stress triggers and response mechanisms Capitalizing on work stress Effective time management and interpersonal skills Career renewal Caring for yourself . . . including a set of comprehensive resources that offer additional tools for self-assessment and taking action. A unique and useful new guide that offers school leaders at all levels an important opportunity for professional development and personal reflection. Educational Leadership. Her editorial board service has included Educational Administration Quarterly, International Studies in Educational Administration, International Journal of Learning, Rural Educator, Journal of At-Risk Issues, Journal of School Leadership, Advancing Women in Leadership On-Line Journal, Journal for Rural School and Community Renewal, International Journal of Learning, and Journal for a Just and Caring Education. She is the recipient of the Stanley Brzezinski Research Award, NCPEA's Living Legend Award, the Donald R. and Mary Lee Swanson Award for Teaching Excellence, UNL's Distinguished Teaching Award, and UNL's Award for Outstanding Contributions to the Status of Women.Grady coordinates an annual conference on women in educational leadership that attracts national attendance and is in its 24th year. She has been an administrator in K-12 schools as well as at the college and university levels. She received her bachelor's degree in history from Saint Mary's College, Notre Dame, Indiana, and her doctorate in educational administration with a specialty in leadership from The Ohio State University.